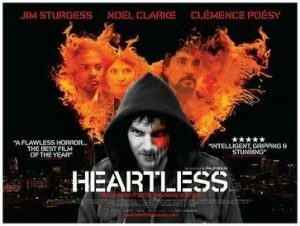 Heartless has many of the typical qualities of British screen fantasy. It’s modestly-budgeted, quirky and imaginative, as well as occasionally amateurish and wildly uneven. This is the third film by painter-author-stage director Philip Ridley, and his first in fourteen years. Ridley scripted Peter Medak’s The Krays (1990) but it was his own films, The Reflecting Skin (1990) and The Passion of Darkly Noon (1995), which were enshrined in cult cinema. 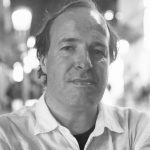 There’s continuity between them and Heartless: all have naïve and troubled male protagonists involved in violence, their stories laced with (often perverse) religious overtones. Ridley set the earlier films in the American plains and backwoods, but Heartless returns to his East End home. It’s the dark story of Jamie (Jim Sturgess from 21 and Across the Universe), a troubled youngster whose derelict, graffiti-scrawled environment is everything the tabloid headlines say and worse. The bestial gangs of hoodies roaming the night streets and tower blocks burn and dismember their victims. Jamie doesn’t even see the killers as human – instead he perceives them as toothy reptiles, of the kind that glam-conspiracy theorist David Icke claims infests the other end of society, royalty and politics. However, Ridley, like Eden Lake’s James Watkins, has no doubt who most of us see as the real monsters. The film offers no other discernable social comment; instead, it’s a modern-dress blend of Faust and Beauty and the Beast. Jamie has scarlet birthmarks on his face and body, which convince him that no woman could want him, despite his glaringly obvious good looks. A fretful man-child virgin, he lives with his loving mother (Ruth Sheen), whose shocking fate prompts Jamie’s journey into darkness. From then on, his trajectory is defined by fathers and fatherhood. His dead father (Timothy Spall) plays a crucial cameo role; a supernatural little girl (Nikita Mistry) takes the role of Jamie’s daughter, protector and partner in murder; and Satan shows up as a scarred bruiser called Papa B (Joseph Mawle). The first meeting with Papa B is impressively staged in a tower-block flat with a fittingly gold sheen. Unfortunately Papa B’s diabolical speech is less than Miltonic, basically a comic-book elaboration on Harry Lime’s quip in The Third Man (1949) about the contrast between Italy (violent and dynamic) and Switzerland (pacifist and stagnant). From this point, Heartless becomes episodic and uneven, but still interesting, especially in its Christian angle. Jamie, at the bidding of Papa B, is born again by burning himself to a charred husk, which he strips off to emerge unmarked and full of light. It’s a demonic inversion of a scene in C.S. Lewis’ Narnia book, The Voyage of the Dawn Treader (now in development at Fox), in which a sinful boy becomes a dragon and must have his scaly skin ripped away. Later in Heartless, after the restored Jamie woos the woman of his dreams (Clemence Posey), they linger in a park that’s plainly Eden. The film’s ending suggests those versions of Faust in which the sinner repents in time. Ridley is indulgently fond of his one-scene characters (a panto rent boy and a profane demon weapons dealer – the latter seems to have stepped from Neil Gaiman’s Sandman comic), even though they destabilise the pace and tone. In its later scenes, Heartless sometimes feel like a pretentious retread of Sam Raimi’s larky Drag Me to Hell, as Jamie agonises over doing bad things to get himself off the Devil’s hook. The focus on a tortured young man whose life is perpetually transformed echoes 2004’s reality-sliding The Butterfly Effect. Sheen, Spall and Noel Clarke offer sound thematic support, though Clarke’s comeuppance is a laugh-out-of-court moment. Still, Heartless’ flaws are often as interesting as its immodest ambitions.